What it does - You can filter this report by any of the fields available on the work order form and it provides a nice breakdown of each work order. The Work Order Summary 2 includes the work order status, the current assigned to, the requester, days aged, labor hours, total costs and more. It can also be grouped by location, craft, purpose, assigned to, etc. and provide you with a total for each grouping as well as a grand total. Why it's great - This is a great high-level all-encompassing summary report. It works really well as a Saved Action where you can save and schedule the report to run on a regular basis. It helps you keep your finger on the pulse of what's going on at your organization. Click on Report in the Actions menu, and then click on Work Order. Enter the criteria for your report, making sure to select Summary Report 2 in Step 21. What it does - The Location Summary provides a nice roll-up for each location including the total labor hours and labor costs, material costs, and a total cost by facility. The report also includes some great additional information: the cost per student as well as the cost per square foot. Why it's great - This report provides a great breakdown of how resources (monetary, time, etc.) have been allocated to each location by providing line item results for each facility. Click on Report in the Actions menu, and then click on Location - Costs. Enter the criteria for your report, making sure to select Summary Report in Step 7. What it does - The Craft Summary includes the number of hours that have been dedicated to each craft, the number of work orders per craft, and the cost for labor and materials. The report also includes some great additional information: the average hours, cost per work order, and the total percentage of work each craft accounts for. Why it's great - This report provides a great breakdown of where your resources (monetary, time, etc.) have been spent in relation to the type of work being done. Click on Report in the Actions menu, and then click on Crafts. Enter the criteria for your report, making sure to select Summary Report in Step 8. Select Craft in the drop down box to sort your report result by Craft rather than Location. What it does - The Purpose Summary breaks down the number of work orders dedicated to each purpose code tracked by your organization. The link item report also includes the total labor hours tracked, labor and material costs, as well as the average cost per WO for each purpose code. Why it's great - This report is great for tracking and reporting how resources (monetary, time, etc.) have been allocated based on the reason why requests were entered into the system. Click on Report in the Actions menu, and then click on Purpose. Enter the criteria for your report, making sure to select Summary Report in Step 6. What it does - This report provides a great breakdown of each employee and the total number of hours they've tracked for the given reporting period. The report also includes the average number of hours each employee enters per work order, the average number of days it takes them to complete a work order, as well as the total number of work orders they worked on during the time period identified. Why it's great - The Detail Employee Cost Report is a great report to track and manage the work load of each of your employees. The report can be generated for a single employee, a team of employees, or all employees. Click on Report in the Actions menu, and then click on Employees. Enter the criteria for your report, making sure to select Detail Employee Cost Report in Step 10. What it does - This report not only includes important information about the transactions entered on a work order, but also the work order information itself. For every transaction returned on the report, the report provides the transaction type, transaction description, quantity, costs, etc. as well as the work order description, location, craft, purpose code, etc. Why it's great - The Transaction Detail is a great report to open with Excel. 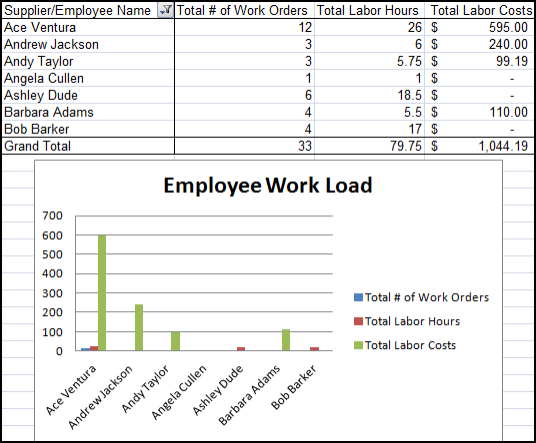 You will be able to use the data to create some very meaningful and powerful charts and tables to illustrate an employee's workload, the total costs allocated to various vendors/suppliers, etc. This report can be setup as a Saved Action to stay on top of labor hours as well as labor, material, and contracted service costs. Click on Report in the Actions menu, and then click on Transactions. Enter the criteria for your report, making sure to select Detail Report in Step 18.